In Pokemon Go, players can battle their Pokemon in an arena by visiting Gyms. 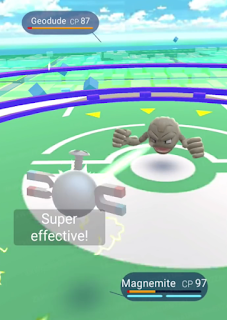 In the Gym battle arena, players use Pokemon Moves to fight their Pokemon against other Pokemon. The main goal of a battle is to reduce the HP of the opposing Pokemon down to zero. Experience Points and Prestige are awarded for winning battles. What are the Benefits of Battles? Players will want to battle at Gyms to gain XP and earn Prestige for friendly Gyms. Successfully winning battles results in gained XP. The amount gained is determined by the number of Pokemon defeated. Successfully challenging and winning a battle at a friendly Gym will grant XP for the challenger and Prestige for that particular friendly Gym. Successfully challenging and winning a battle at an enemy Gym will not only grant XP for the winner, it will also reduce the Prestige of the opposing Team’s Gym. Battles take place in Gyms, which can be found scattered throughout the world. Similar to Pokestops, Gyms are shown on the map as a floating marker with arena platforms. Simply walk up to a Gym to interact with it and (if controlled by a Team) the option to battle will be available to you. When you visit your first Gym you will be asked to join either the Blue, Red or Yellow Team. This is the Team that you will battle for going forward. After choosing a Team, you can battle at any Gym that you visit. Players can fight in Training Battles at friendly Gyms and Team vs.Team battles at enemy Gyms. A Pokemon must be at full HP before it can be sent into battle. If a Pokemon is at 0 HP it must be revived. If a Pokemon has a small amount of HP, Potions can be used to replenish a Pokemon back to full health. How Does Battling Actually Work? Battles take place in real-time. Players have the option of using Pokemon Charge and Fast Moves to attack the opposing Pokemon. 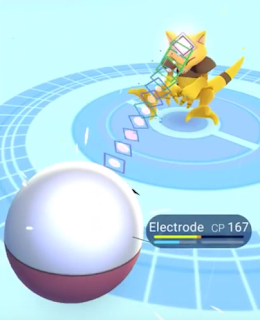 Charge Moves are performed during battle by pressing and holding, while Fast Moves are performed by tapping the screen. Charge Moves require Stamina (Energy) to use, while Fast Moves do not. Moves can also be Dodged by swiping either right or left on the screen. If a Move is Dodged it will deal no damage. A battle is won when all opposing Pokemon have been defeated (HP reduced to 0). The damage dealt and received in battle is mainly determined by Pokemon CP (Combat Points), Moves Type(s) and Pokemon Types. Some Move Types may be Super Effective against certain Types of Pokemon, while other Move Types may be Not Very Effective. Understanding the strengths and weaknesses of each Type is critical to getting that advantage during battle. During battle, the challenger (attacker) will use Moves and the Dodge ability to help defeat the Defending Pokemon. The Defending Pokemon will be controlled by AI (not player controlled). This Pokemon will automatically use Moves and Dodge during battle. #1. All Defending Pokemon at a Gym are defeated. #2. All Pokemon on the challenger’s Team is defeated. - Before challenging a Gym compare the CP of the defending Pokemon to your own. - Before challenging a Gym compare the Types of the defending Pokemon to your own. - Make sure you have the advantage before battling. Unless your Pokemon is much weaker than the defending Pokemon you (the challenger) should win majority of the time. "Tap to use a normal move, Press to use a special move"... ok. It seems like the enemy pokemon attack when they feel like it... at some rate that is not apparent to me. Or is it turn based and I just haven't caught on and am doing something to miss my turns? Put simply, can I take my time and think, or must I tap or press the screen every 3/4ths of a second or somesuch? If it's continuous, it would be REALLY helpful to understand the idea rate at which to be tapping.